Who should not take Captopril-Hydrochlorothiazide? This medication is used to treat high blood pressure (hypertension). Lowering high blood pressure helps prevent strokes, heart attacks, and kidney problems. This product contains two medications, captopril and hydrochlorothiazide. Captopril belongs to a class of drugs known as ACE inhibitors. It works by relaxing blood vessels so blood can flow more easily. Hydrochlorothiazide is a "water pill" (diuretic). This drug increases the amount of urine you make, causing your body to get rid of extra salt and water. Take this medication by mouth on an empty stomach one hour before a meal, usually once daily or as directed by your doctor. It is best to avoid taking this medication within 4 hours of your bedtime to avoid having to get up to urinate. Consult your doctor or pharmacist if you have questions about your dosing schedule. Drink plenty of fluids to prevent losing too much body water (dehydration). If you are on restricted fluid intake, consult your doctor for further instructions. If you are also taking cholestyramine or colestipol, take captopril/hydrochlorothiazide at least 4 hours before or at least 4 to 6 hours after either of those drugs. The dosage is based on your medical condition and response to therapy. The manufacturer recommends that daily doses should not be more than 150 milligrams of captopril and 50 milligrams of hydrochlorothiazide. Use this medication regularly in order to get the most benefit from it. To help you remember, take it at the same time each day. Do not skip doses or stop taking this medication unless directed by your doctor. It is important to continue taking this medication even if you feel well. Most people with high blood pressure do not feel sick. It may take up to 6-8 weeks before the full benefit of this drug takes effect. What conditions does Captopril-Hydrochlorothiazide treat? Dizziness, lightheadedness, drowsiness, headache, tiredness, blurred vision, loss of taste, or dry cough may occur as your body adjusts to the medication. You may also experience decreased sexual ability. If any of these effects persist or worsen, notify your doctor or pharmacist promptly. This product may cause a loss of too much body water (dehydration) and salt/minerals. Tell your doctor right away if you have any symptoms of dehydration or mineral loss, including: extreme thirst, very dry mouth, muscle cramps/weakness, fast/slow/irregular heartbeat, confusion. Tell your doctor right away if any of these unlikely but serious side effects occur: signs of infection (e.g., fever, chills, persistent sore throat), easy bruising/bleeding, symptoms of a high potassium blood level (such as muscle weakness, slow/irregular heartbeat), numbness/tingling/swelling of the hands/feet, muscle/joint aches, decrease in vision, eye pain. This drug may rarely cause serious (possibly fatal) liver problems. Seek immediate medical attention if you notice any of the following rare but very serious side effects: yellowing eyes/skin, dark urine, severe stomach/abdominal pain, persistent tiredness, persistent nausea/vomiting. Seek immediate medical attention if this rare but very serious side effect occurs: signs of kidney problems (such as change in the amount of urine). A very serious allergic reaction to this drug is unlikely, but seek immediate medical attention if it occurs. Symptoms of a serious allergic reaction may include: rash, itching/swelling (especially of the face/tongue/throat/arms/legs), severe dizziness, trouble breathing. List Captopril-Hydrochlorothiazide side effects by likelihood and severity. Before taking this product, tell your doctor or pharmacist if you are allergic to either captopril or hydrochlorothiazide; or to other ACE inhibitors (e.g., enalapril, lisinopril); or to other thiazides (e.g., chlorothiazide); or if you have any other allergies (including an allergic reaction after exposure to certain membranes used for blood filtering). This product may contain inactive ingredients, which can cause allergic reactions or other problems. Talk to your pharmacist for more details. This medication should not be used if you have certain medical conditions. Before using this medicine, consult your doctor or pharmacist if you have: a history of an allergic reaction that included swelling of the face/lips/tongue/throat (angioedema), an inability to make urine. Before using this medication, tell your doctor or pharmacist your medical history, especially of: kidney problems, liver disease, gout, untreated salt/mineral imbalance (e.g., imbalance of sodium, potassium, magnesium, calcium), loss of too much body water (dehydration), collagen vascular disease (e.g., lupus, scleroderma), recent nerve surgery (e.g., sympathectomy). You can develop dehydration if you do not drink enough fluids or if you have too much diarrhea, vomiting, or sweating. This can cause dizziness and lightheadedness due to low blood pressure. Avoid heavy exercise, and keep cool in hot weather. Contact your doctor if you are unable to drink fluids or if you have persistent diarrhea or vomiting. If you have diabetes, hydrochlorothiazide may affect your blood sugar. Check your blood sugar regularly as directed and share the results with your doctor. Tell your doctor right away if you have symptoms of high blood sugar such as increased thirst/urination. Your doctor may need to adjust your diabetes medication, exercise program, or diet. What should I know regarding pregnancy, nursing and administering Captopril-Hydrochlorothiazide to children or the elderly? Some products that may interact with this drug are: aliskiren, cisapride, diazoxide, dofetilide, certain drugs that weaken the immune system/increase the risk of infection (such as everolimus, sirolimus), lithium, probenecid, drugs that may increase the level of potassium in the blood (such as ARBs including losartan/valsartan, birth control pills containing drospirenone), other "water pills" (diuretics such as amiloride, furosemide, triamterene), gold injections, sacubitril. A very serious reaction may occur if you are getting injections for bee/wasp sting allergy (desensitization) and are also taking captopril with hydrochlorothiazide. Make sure all your doctors know which medicines you are using. Does Captopril-Hydrochlorothiazide interact with other medications? Laboratory and/or medical tests (e.g., sodium and potassium blood levels, kidney function) should be performed from time to time to monitor your progress or check for side effects. Consult your doctor for more details. 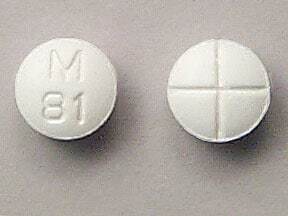 This medicine is a white, round, double-scored, tablet imprinted with "M 81". 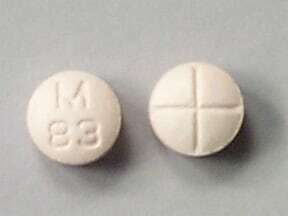 This medicine is a peach, round, double-scored, tablet imprinted with "M 83". 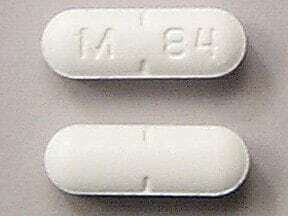 This medicine is a white, oblong, partially scored, tablet imprinted with "M 84". 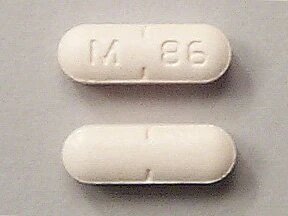 This medicine is a peach, oblong, partially scored, tablet imprinted with "M 86". Are you considering switching to Captopril-Hydrochlorothiazide? How long have you been taking Captopril-Hydrochlorothiazide?